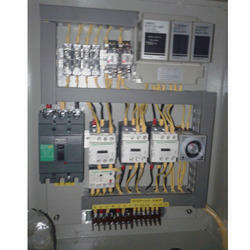 Leading Manufacturer of three phase electronic pump control panels and star delta starter control panels from Ahmedabad. We are the well-known manufacturer and supplier of Single Phase & Three Submersible Pump Control Panel that is extensively used in several industrial & residential places for controlling electric power supply. The panel, provided by us is made available in various technical specifications in order to cater. With huge company experience and knowledge, we are providing superior quality range of Star Delta Starter Control Panels. Our offered range is widely demanded in various industries including electrical and mechanical for controlling the functioning of heavy duty machines. The team of quality analyzer supervises various development activities in order to check panel consistency. Phase failure / loss from supply and motor side. Phase reversal / wrong phase sequence from supply side. Phase to phase current unbalance 50 % of set current. Remote sensing dry run / No load current. Extreme high current (EHC) or short circuit as per pump current. Microcontroller based digital product with high reliability and long life. World class MCU and software which is highly fault tolerant to noise and Electro magnetic interferences and noise from motor, starter etc. SMPS based power supply works from 200 to 500 volts. Produced in ISO 9001: 2000 certified company. Star delta starter with khyatee make heavy duty 40 amps, 4 pole AC coil Contactors Or as required i.e. Siemens, L&;T etc for long life. Pump current setting is easy, accurate, auto setting type, with digital display. Pump current setting range is 2-14 for 5-10 hp or. Pump current setting range 8-20 amps for 10-15 hp or. Pump current setting range 18-34 amps for 20-30 hp. Overload is site selectable from 20 to 50 % of set current. Dry run setting from 75 to 95 % in increment of 1 % amps. Dry run bypasses facility with digital display. Site selectable Auto / Manual operation switch. Calibrated Digital Voltmeter with 200 to 500 volt ± 2 volt. Accuracy. Calibrated Digital Ammeter 0.5 to 28 amps ± 0.2 amps Accuracy. Digital display for fault ampere at tripping. In built memory to show last setting value. On site AUTO FAULT DETECT (AFT) for AC voltage, LEDS, Display, Relay, etc. Site selectable star to delta timer from 10 to 99 seconds. Digital display for countdown timer. On delay timer for one minute for auto start for power failure and SPP faults. Time delay to filter power on spikes and surges. Widest working voltage range from 200 to 500 volts. Three pole MCB of required amps for short circuit and main switch. 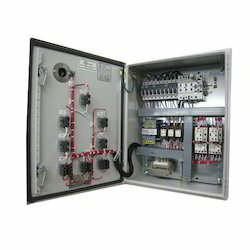 Unit has heavy duty ON – OFF, Setting and Auto / Manual switches. Color coded ISI grade Teflon wiring with lugs for longer life. Modular design very easy to install and site servicing. Heavy duty terminal for input / output connections. Eliminates the need for separate star delta starter, auto switch, voltmeter and ammeter.